Scary incident for the Canucks veteran. Midway through the third period of tonight’s contest between the Vancouver Canucks and Philadelphia Flyers, veteran Canucks defenseman Alex Edler got tangled up with Flyers forward Jakub Voracek and took a nasty spill on the ice. He appeared to lose consciousness and had to be taken off the ice on a stretcher. It was a scary play, but word is that Edler is now conscious and sitting up. Here’s a clip of Edler being stretcher off the ice while Voracek gives him a pat and, presumably, apologizes. 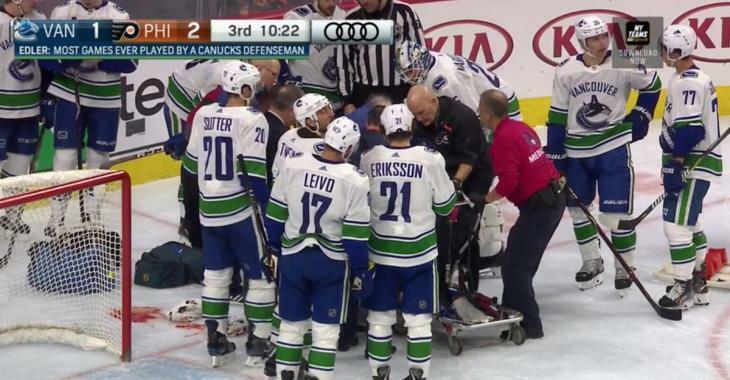 No official word from the Canucks yet, but here’s hoping Edler’s injury is not serious.